42nd IAH International Congress “Hydrogeology: Back to the Future”, Rome, Italy. 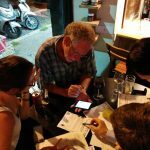 The Early Career Hydrogeologists’ Network (ECHN) completed their fifth IAH congress in Rome. The increasing number of the network members within the 5 years of its existence was a solid proof of the success of the network growth has shown during the 42nd IAH congress where ECHN steering committee (SC) was strongly represented by six of its members as well as about 200 early career delegates. nted its main goals, activities and initiatives developed along the year and events in the IAH congresses. This year the chair of ECHN Italy, Eloisa Di Sipio, joined the meeting and shared the activities being held by the national branch. The work and involvement of the ECHN Italian branch in the congress organization is noteworthy, reinforcing the importance of the early career members within the Association. Carlos Maldaner (Brazil/Canada) was appointed as the new co-chair, replacing Matthys Dippenaar (South Africa), and joining the other current co-chair Gillian Hurding (Scotland). Matthys will now become an advisor of the network to ensure continuity within the group and to support the involvement of new members in our steering committee. On behalf of ECHN-IAH, we would like to thank Matthys for the dedication to our network and wish him all the best for the new task as director of the IAH South African Chapter! The general meeting was followed by the highly expected Social Function with the participation of the ECHN’s SC, ECHN members, IAH council members, and everyone else who felt like join it. The Social Function started with a “Hydro Mingle”, as an ice-breaker allowing people to know each other and exchange personal and professional experience. It was followed by an original/different challenge. Participants were distributed randomly in groups to find out the solution for three “hydro crime” scenarios set in an adapted version of Cluedo, the “Hydro Cluedo”. Like the previous year the ECHN counted with the collaboration of the HWB-UK that provided technical information on a case study from Chad, which was adapted as one of the Hydro crimes to be solved. After the success of the previous ‘ECHN lunch side sessions’ in Perth and Marrakech to provide useful publication and communication tips for early career delegates, Cliff Voss, the Hydrogeology Journal (HJ) executive editor and HJ’s editors hosted a session with the main purpose of enlightening ECH how to write “knock-out papers”. More than 100 delegates attended the session. During the IAH Annual General Meeting, we had the opportunity to award the winner of the IAH-ECHN ‘Coolest Paper of 2014 A ward’, promoted with the objective to energize the early career hydrogeologist community, encourage the discussion of new papers and share the most recent achievements in groundwater scientific knowledge, as well as original, creative and thorough papers. The winner was Dr. Antonio Hernández-Espriú from the Earth Sciences Division, Universidad Nacional Autónoma de México (UNAM), Ciudad Universitaria, Mexico, with the paper “The DRASTIC-Sg model: an extension to the DRASTIC approach for mapping groundwater vulnerability in aquifers subject to differential land subsidence, with application to Mexico City”. 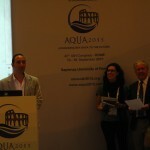 Dr. Hernández-Espriú received a free IAH membership for one year, one free book from the IAH book series and was invited to present the winning paper during the congress with the special support of UNESCO-IHP that covered his travelling expenses and the Italian Chapter of IAH, who were kind to waive the registration fee. Members of the IAH Secretariat and the Early Career Hydrogeologists’ Network (ECHN) have dynamized the book exchange and to encourage a lively knowledge sharing.